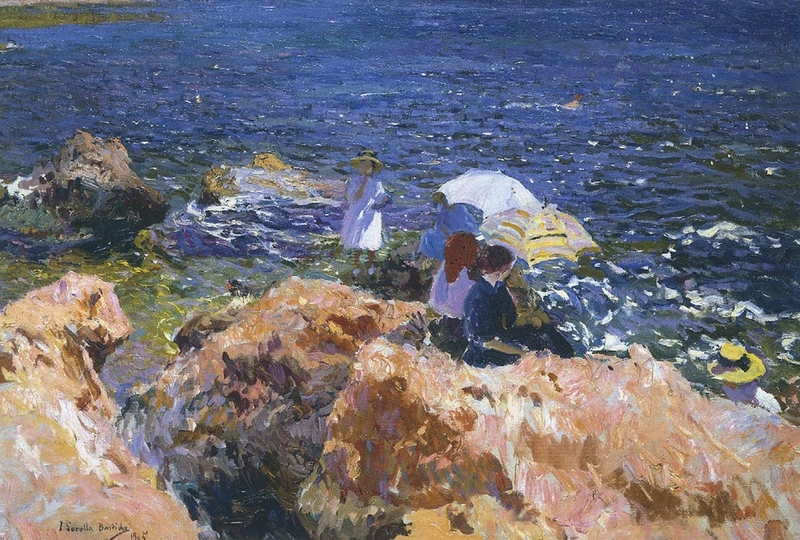 Joaquin Sorolla (Valencian Spanish, Impressionism, 1863-1923): On the Rocks at Javea, 1905. Oil on canvas, 89.7 x 126.5 cm (35-1/3 x 49-4/5 inches). Private Collection. 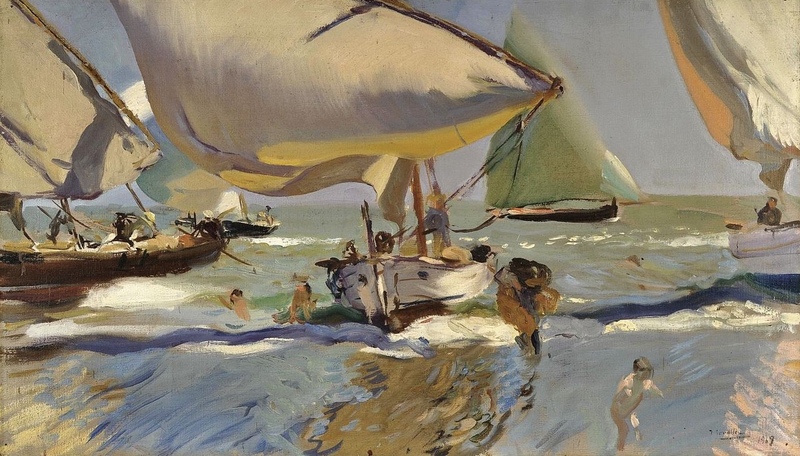 Joaquin Sorolla (Valencian Spanish, Impressionism, 1863-1923): Just Out of the Sea, 1915. Oil on canvas, 130 x 155 cm. 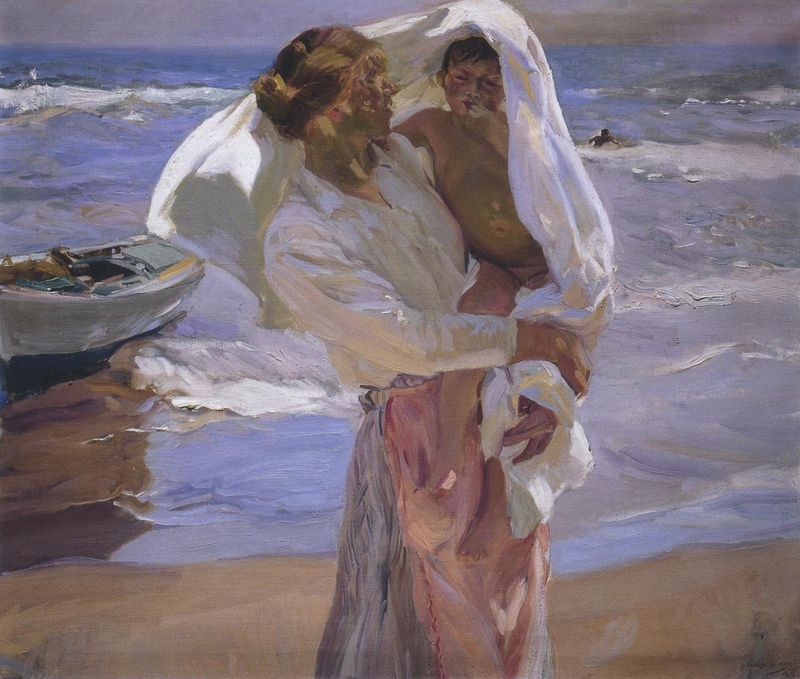 Museo Sorolla, Madrid, Spain. 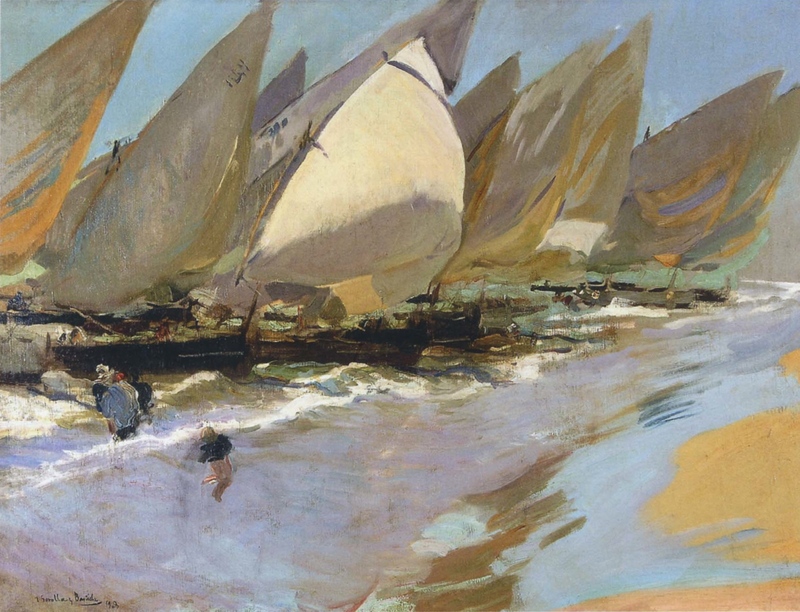 Joaquín Sorolla (Valencian Spanish, 1863-1923): Fishing Boats, 1915. Oil on canvas, 88 x 126 cm. Private Collection. 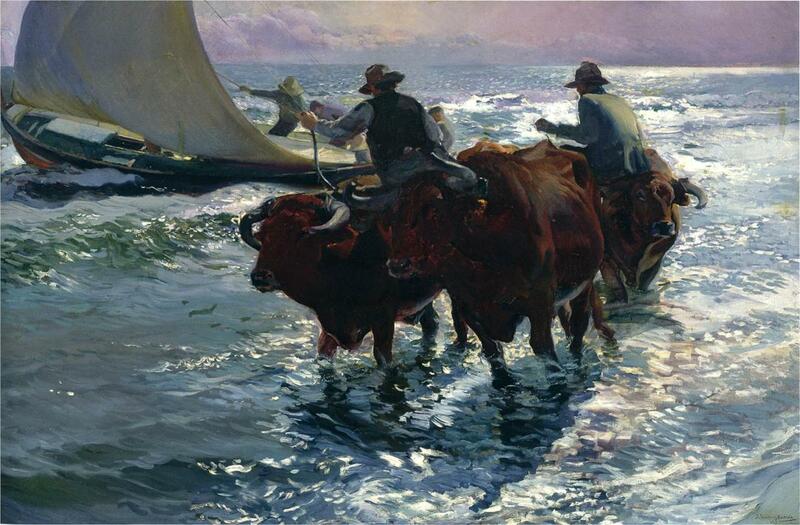 Joaquin Sorolla (Valencian Spanish, Impressionism, 1863-1923): Bulls in the Sea, 1903. 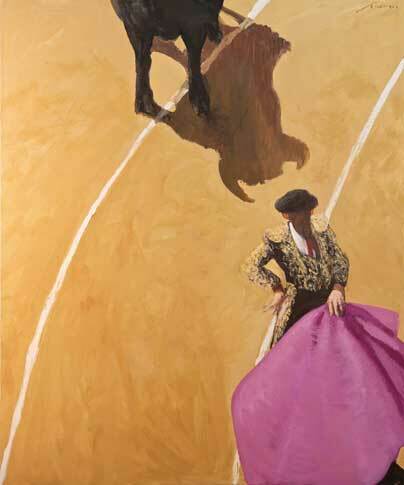 Oil on canvas, 131 x 190 cm (51.6 x 74.8 inches). Private Collection. 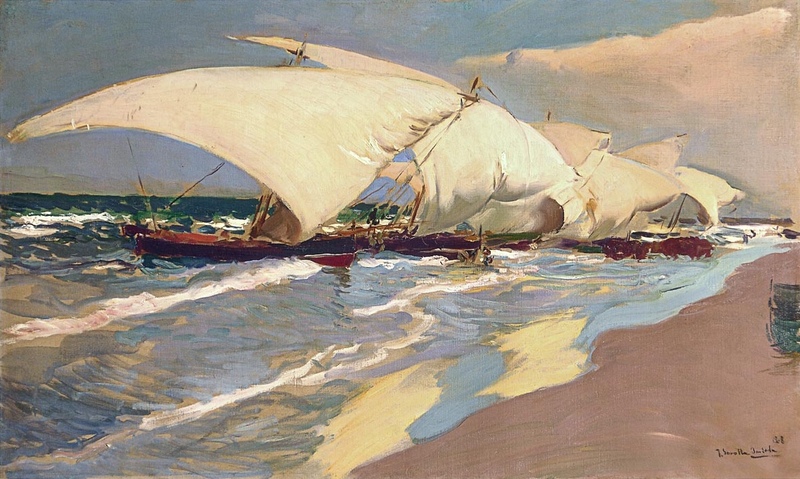 Joaquin Sorolla (Valencian Spanish, Impressionism, 1863-1923): Boats on the Shore (Barcas en la playa), 1909. Oil on canvas, 56 x 94 cm (22 x 37 inches). Private Collection. 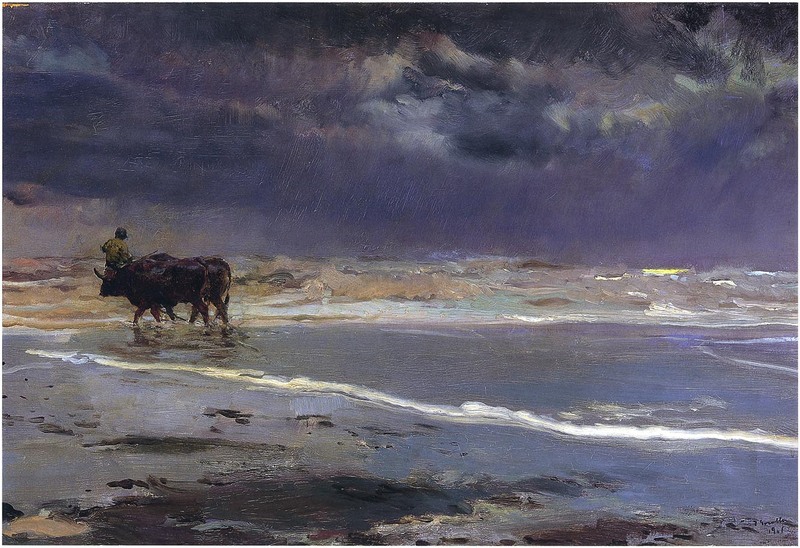 Joaquin Sorolla (Valencian Spanish, Impressionism, 1863-1923): Gray day on Valencia Beach, 1901. Oil on canvas, 64 x 95 cm (25.2 x 37.4 inches). Private Collection. Joaquin Sorolla (Valencian Spanish, 1863-1923): Louis Comfort Tiffany, 1911. Oil on canvas, 150 x 225 cm. Hispanic Society of America, New York, NY, USA. Joaquin Sorolla (Valencian Spanish, Impressionism, 1863-1923): Valencian Boats, 1908. Oil on canvas. 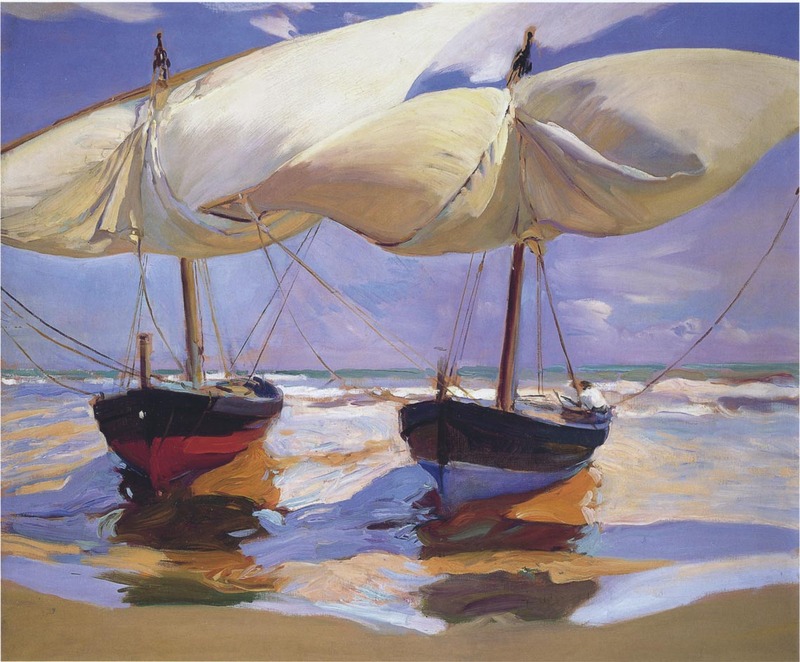 Joaquin Sorolla (Valencian Spanish, Impressionism, 1863-1923): Beached Boats, 1915. Oil on canvas, 100 x 120 cm (39 x 47 inches). 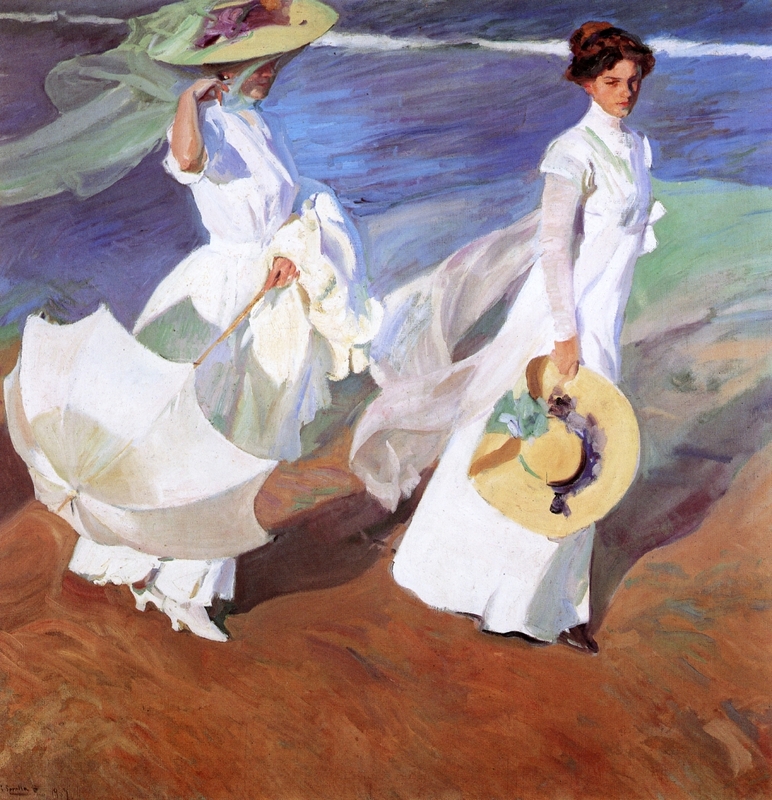 Joaquin Sorolla (Valencian Spanish, Impressionism, 1863-1923): Paseo a la orillas del mar (Walk to the Sea), 1909. Oil on canvas, 205 × 200 cm (80.7 × 78.7 inches). Sorolla Museum, Madrid, Spain. 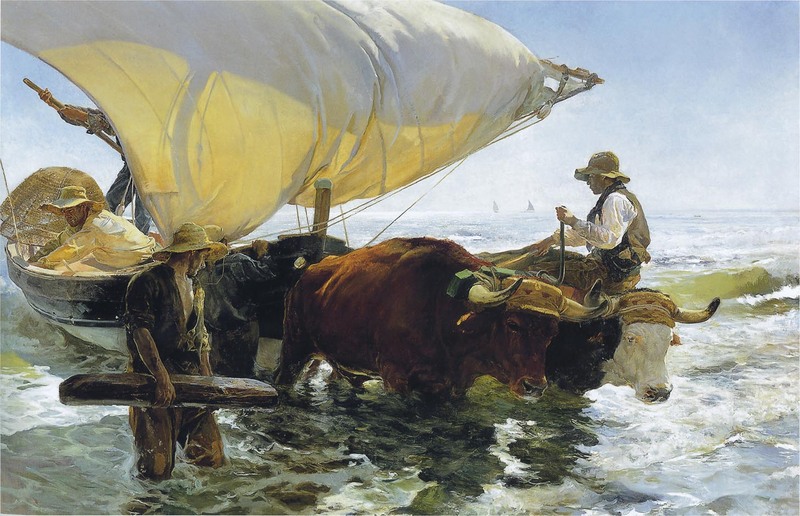 Joaquin Sorolla (Valencian Spanish, Impressionism, 1863-1923): Return from Fishing, Hauling in the Boat; 1894. Oil on canvas, 265 x 403.5 cm. Musée d’Orsay, Paris, France. John Singer Sargent (1856-1925), preeminent portraitist of his generation, was born to American parents in Florence, Italy. He received early training in Paris under Carolus-Duran. The artist lived his life largely as an expatriate in Europe, but worked on both sides of the Atlantic in later years. 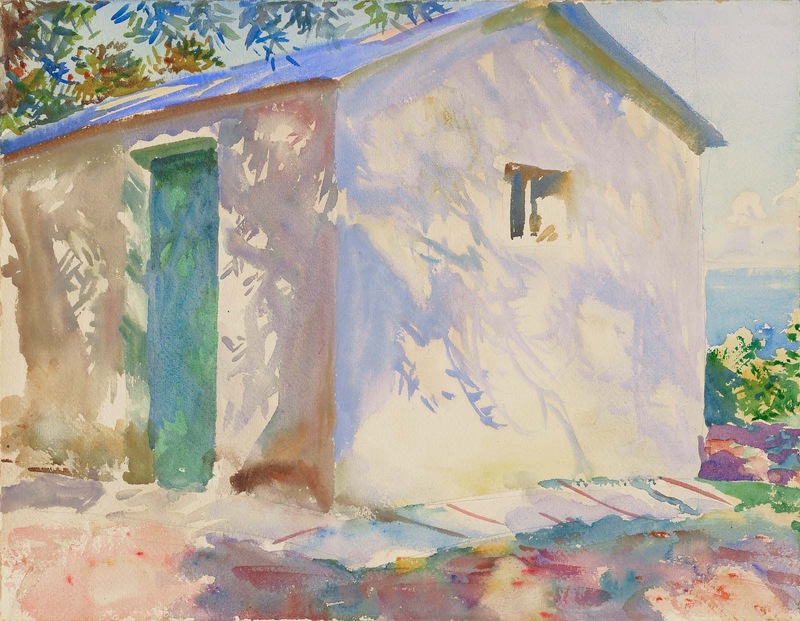 By 1907, Sargent shifted his attention from formal portraiture to watercolors. During the course of his career, he amassed over two thousand watercolor works. It is reported that even prior to 1907, his studio was filled to overflowing with watercolor works heaped high, all created for private viewing, none for sale. 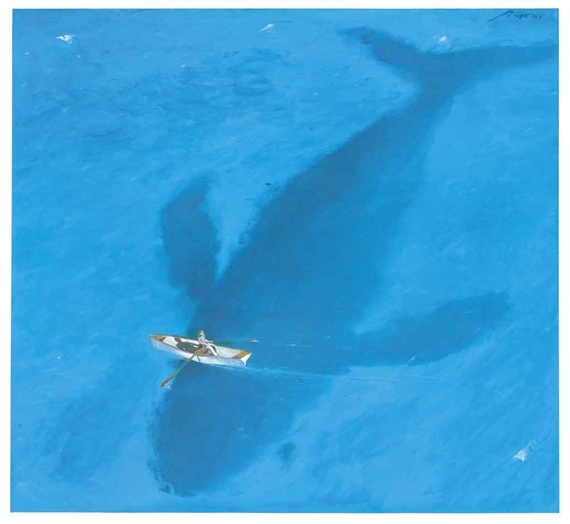 (Joshua Rothman, “Sargent’s Watercolors,” The New Yorker, July 17, 2013.) 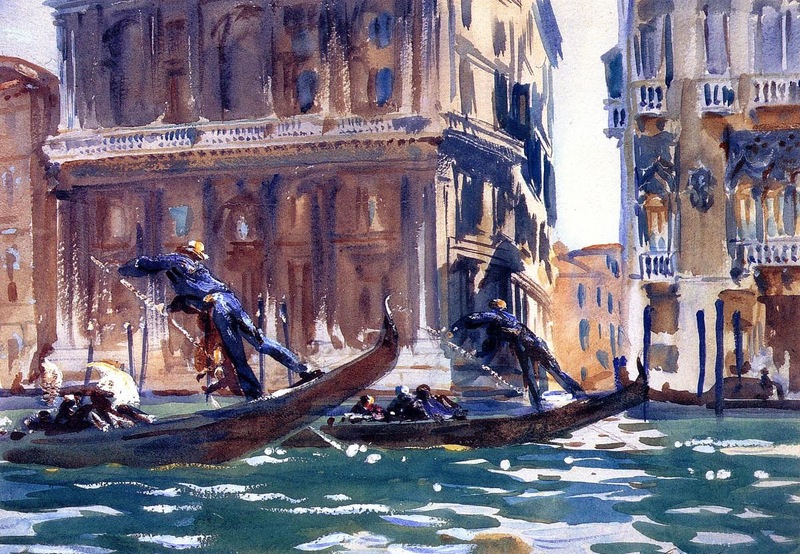 He regularly utilized both transparent and opaque watercolor techniques, breaking with traditional European transparent technique to achieve a unique, robust vigor. 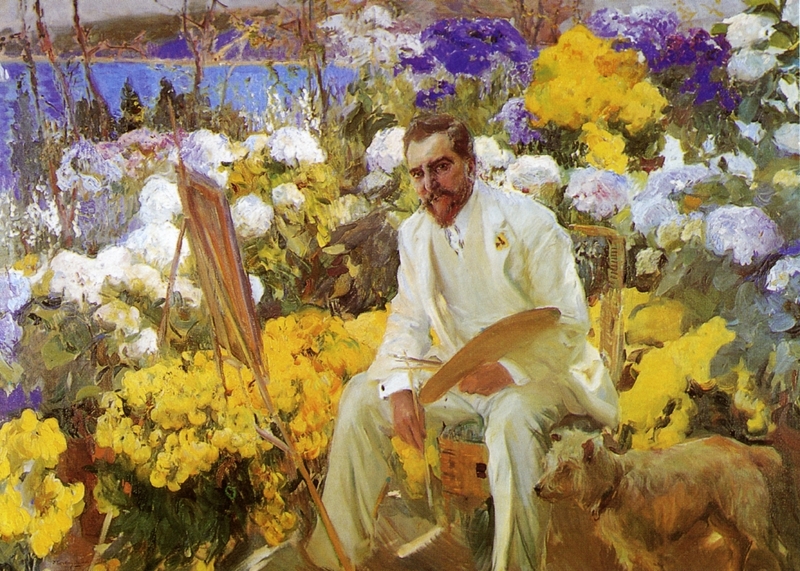 Though clearly absorbed by the capture of light in his works, he did not aspire to the goals or techniques of the Impressionists. Unconfined by subject matter or technique, the results of this large body of work are perhaps unrivaled in the effects of a fluid and lively spontaneity and wondrous light. John Singer Sargent (American, Impressionism, 1856–1925): On the Canal, 1903. Watercolor on paper, 34.29 x 49.53 cm. Musée du Petit Palais, Paris, France. John Singer Sargent (American, Impressionism, 1856–1925): “Corfu: Lights and Shadows,” 1909. Translucent and opaque watercolor, with wax resist, over graphite on paper. Sheet: 40.3 x 53.1 cm (15-7/8 x 20-7/8 inches). Museum of Fine Arts, Boston, Massachusetts, USA. 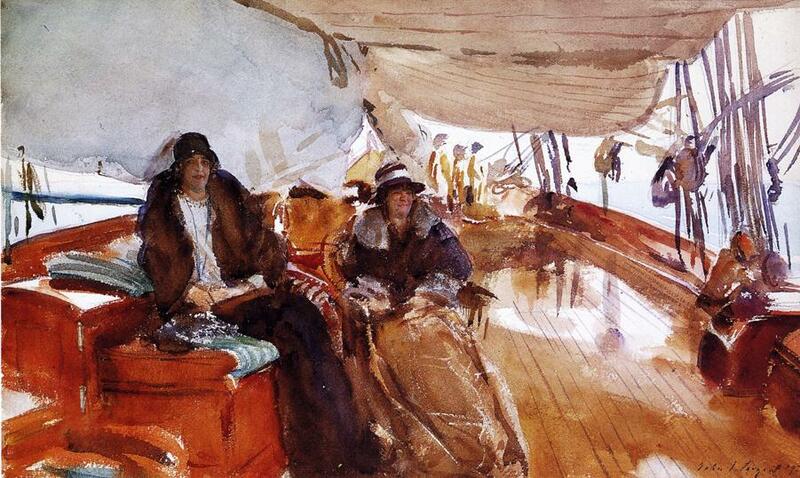 John Singer Sargent (American, 1856–1925): Rainy Day on the Deck of the Yacht Constellation, 1924. Watercolor on paper, 13.25 x 21 inches (33.66 x 53.34 cm). Private Collection. 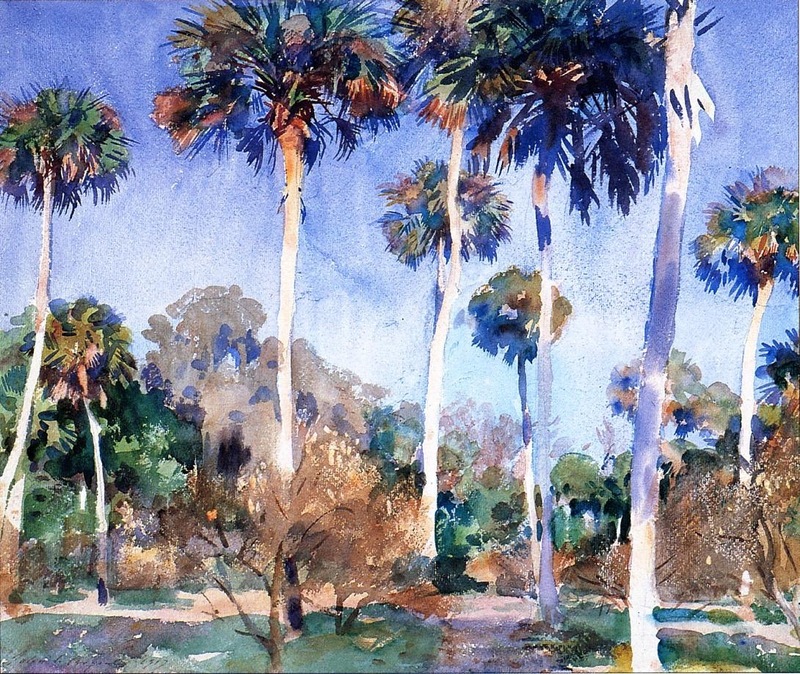 John Singer Sargent: Palms, 1917. Watercolor, graphite on paper, 40 x 55.6 cm. Worcester Art Museum, Worcester, Massachusetts, USA. 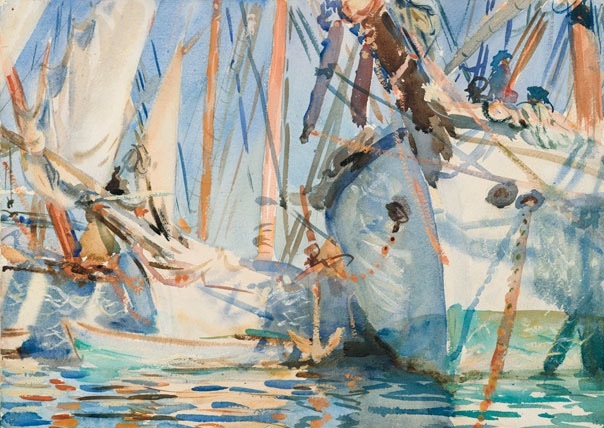 John Singer Sargent (American, Impressionism, 1856–1925): White Ships, c. 1908. Translucent and opaque watercolor and wax resist with graphite underdrawing, 14 x 19-3/8 inches (35.6 x 49.2 cm). Brooklyn Museum, Brooklyn, New York, USA. 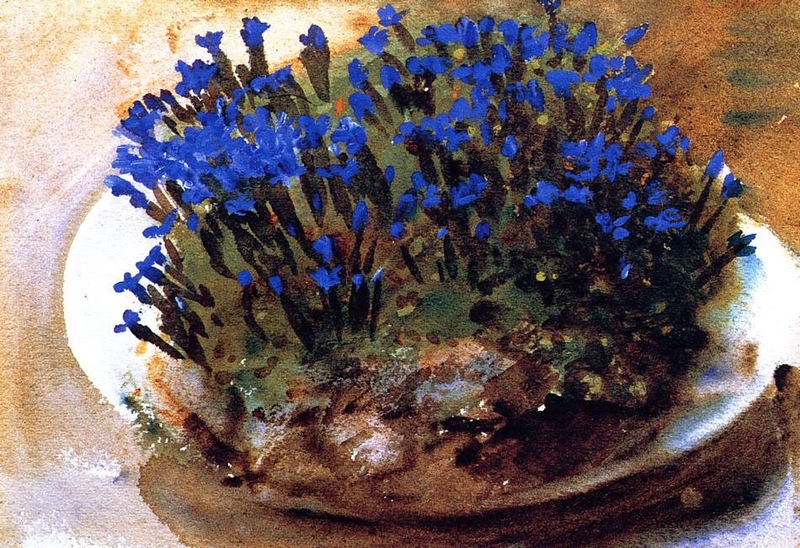 John Singer Sargent (American, Impressionism, 1856–1925): Blue Gentians, 1905. Watercolor on paper, 24.1 x 35.6 cm. Private Collection. 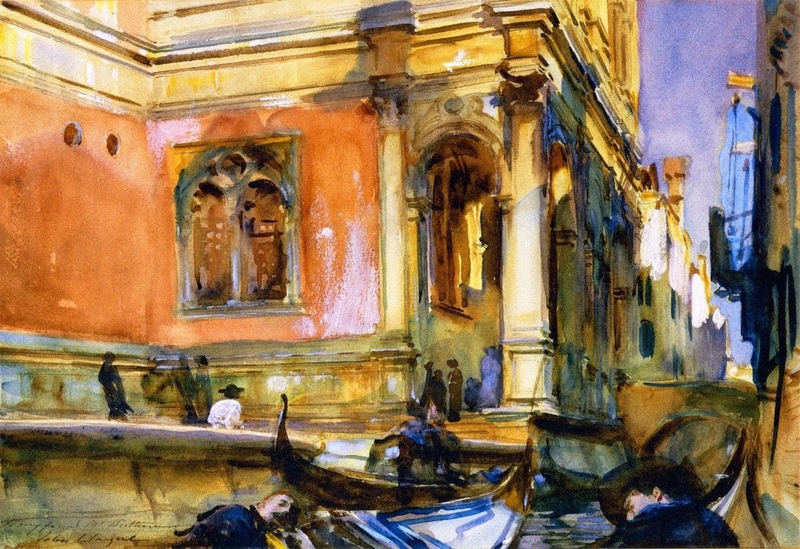 John Singer Sargent (American, Impressionism, 1856–1925): Scuola Grande di San Rocco, c. 1904. Graphite and watercolor on paper, 36.8 x 52.7 cm. Private Collection. 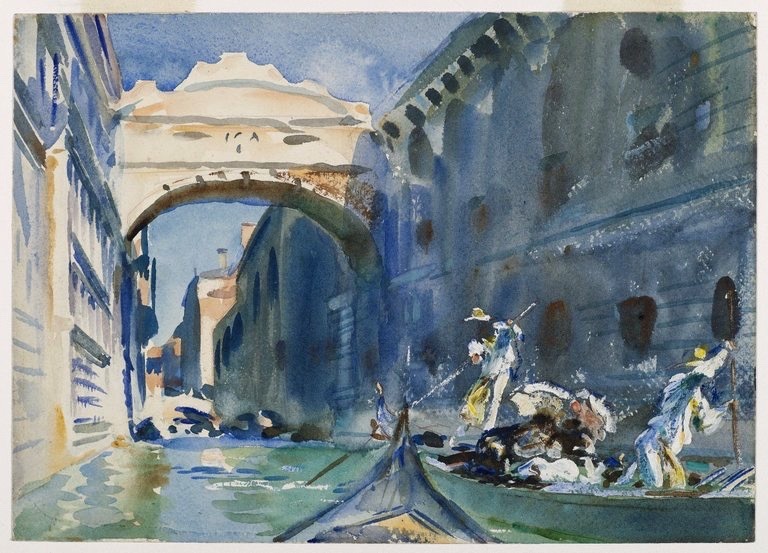 John Singer Sargent (American, Impressionism, 1856–1925): The Bridge of Sighs, c. 1903-1904. Watercolor on paper, 10 x 14 inches (25.4 x 35.6 cm). Brooklyn Museum, Brooklyn, New York, USA. 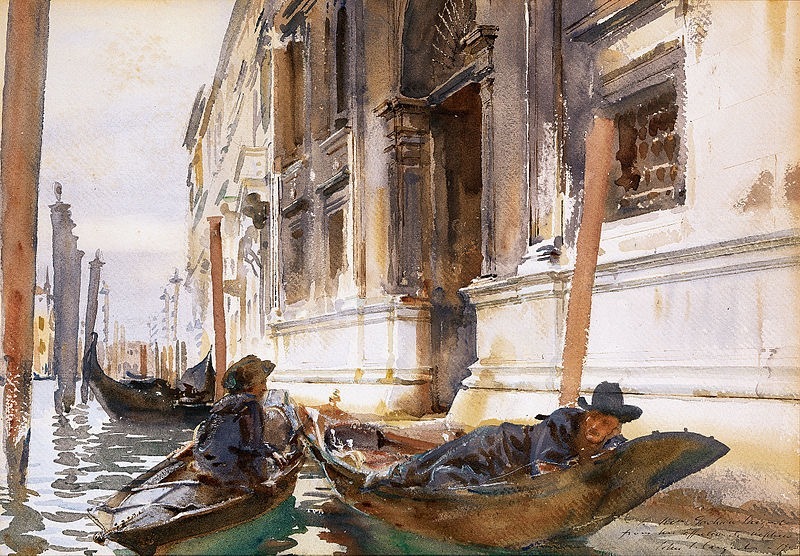 John Singer Sargent (American, 1856–1925): Gondoliers’ Siesta, 1905. Watercolor on paper, 35.6 x 50.8 cm. Private Collection of Margaret and Raymond Horowitz. 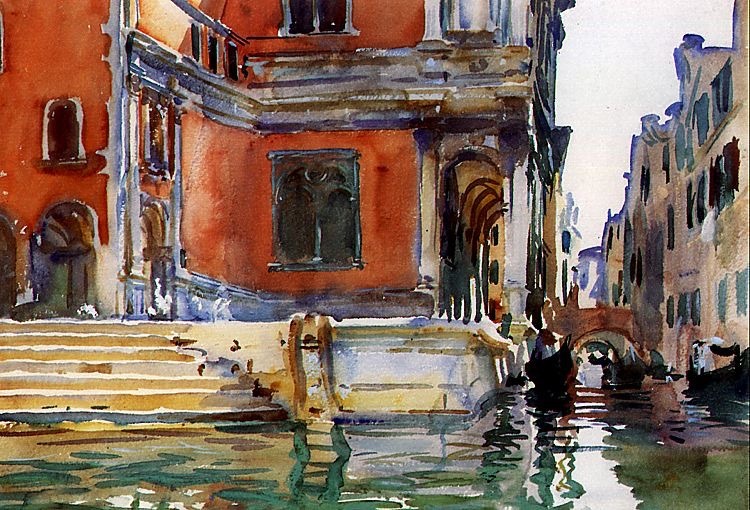 John Singer Sargent (American, 1856–1925): Venetian Interior, c. 1903. Transparent watercolor and opaque white watercolor over graphite on watercolor paper sheet, 9-13/16 x 13-7/8 inches (25.9 x 35.2 cm). Philadelphia Museum of Art, Philadelphia, Pennsylvania, USA. 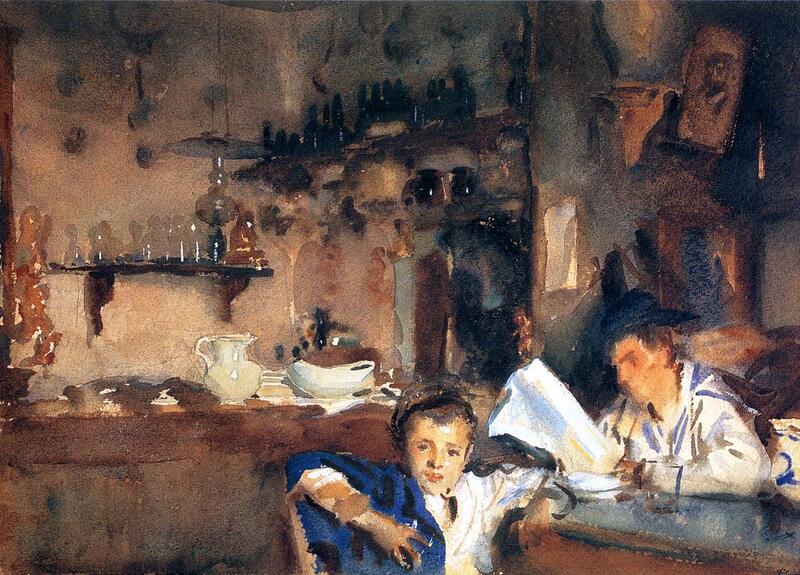 John Singer Sargent (American, Impressionism, 1856–1925): Scuola di San Rocco, 1903. Created in Venice, Italy. Watercolor on paper, 35.6 x 50.8 cm. Private Collection. Image: Pragmatic Romanticist. 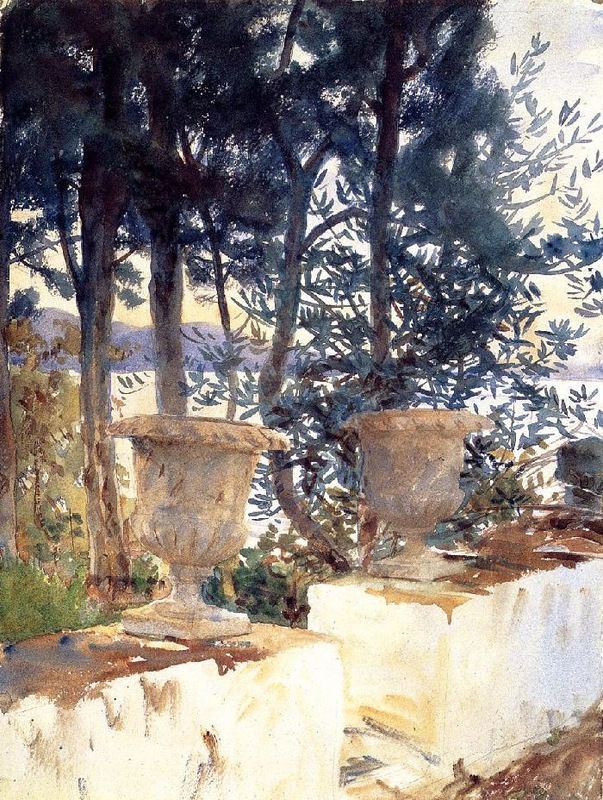 John Singer Sargent (American, Impressionism, 1856–1925): Corfu, The Terrace, 1909. Translucent watercolor, with touches of opaque watercolor and wax resist, over graphite on paper; 52.8 x 40.2 cm (20-13/16 x 15-13/16 inches). Museum of Fine Arts, Boston, Massachusetts, USA. 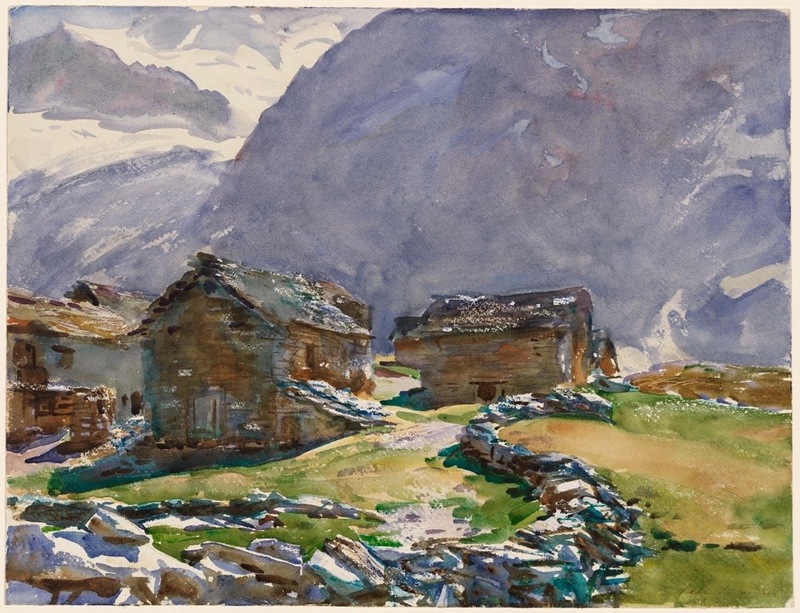 John Singer Sargent (American, Impressionism, 1856–1925): Simplon Pass, Chalets; 1911. Translucent watercolor, with touches of opaque watercolor and wax resist, over graphite on paper; 40.0 x 52.1 cm (15-3/4 x 20-1/2 inches). Museum of Fine Arts, Boston, Massachusetts, USA. Photo: © Museum of Fine Arts, Boston. 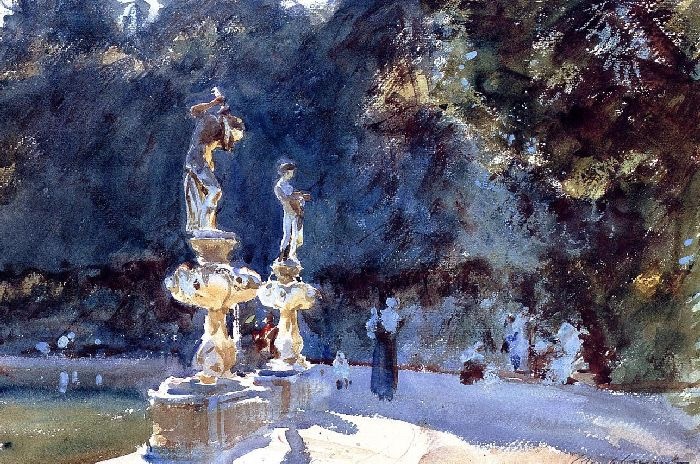 John Singer Sargent (American, Impressionism, 1856–1925): Villa di Marlia, Lucca: A Fountain; 1910. Translucent watercolor, with touches of opaque watercolor and wax resist, over graphite on paper; 40.4 x 53.1 cm (15-7/8 x 20-7/8 inches). Museum of Fine Arts, Boston, Massachusetts, USA. 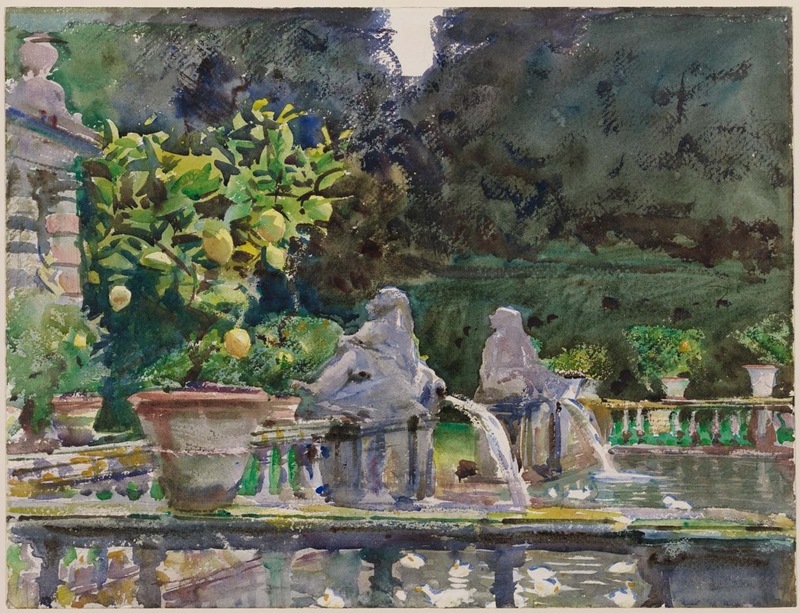 John Singer Sargent (American, Impressionism, 1856–1925): Fountain, Boboli Gardens; 1907. Translucent watercolor, with touches of opaque watercolor and wax resist, over graphite on paper; 33.1 x 49.9 cm (13-1/16 x 19-5/8 inches). Museum of Fine Arts, Boston, Massachusetts, USA. 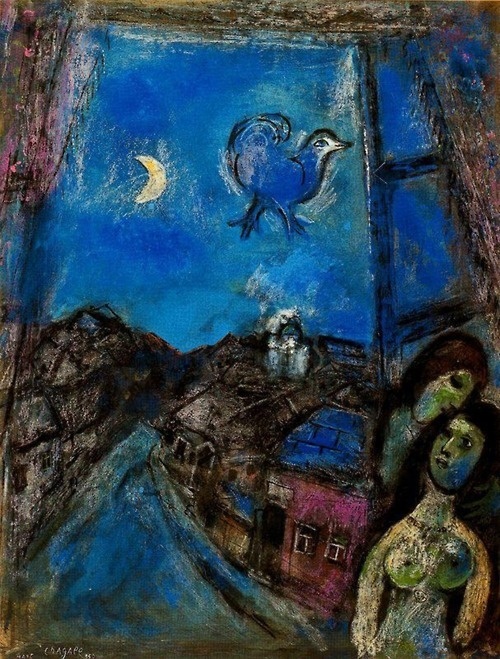 Marc Chagall: Evening at the Window, 1950. Oil on canvas. Sammlung Rosengart Art Museum, Lucerne, Switzerland. 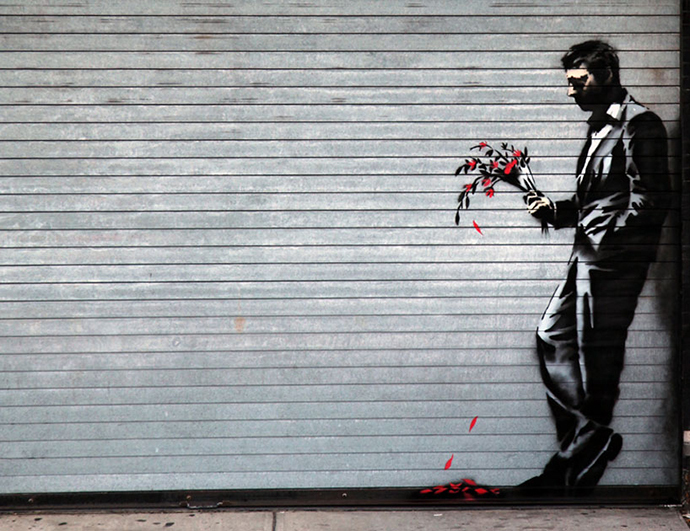 Banksy (United Kingdom-based; graffiti artist, street art, political activist, film director, and painter): “Waiting in vain…at the door of the club” (Man with Flowers), 2013. Seen on a roll-down security gate covering the main entrance to Larry Flint’s Hustler Club in Hell’s Kitchen, New York, NY. 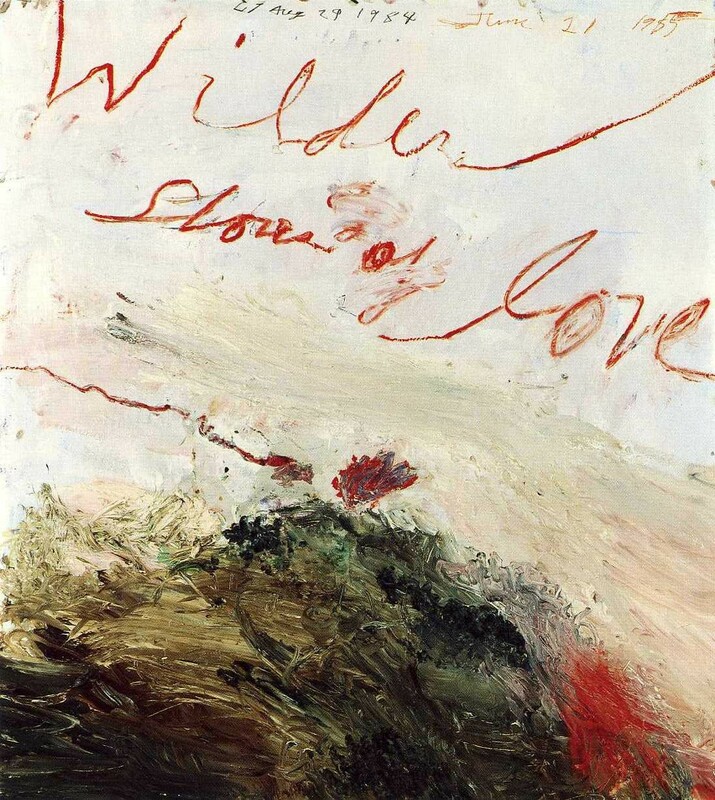 Cy Twombly (American, Contemporary, 1928–2011): Wilder Shores of Love, Bassano in Teverina, 1985, Oil based house paint, oil crayon, coloured pencil, lead pencil on wooden panel, 55-1/8 x 47-1/4 inches (140 x 120 cm), Private Collection. © Cy Twombly, Walther Dräyer, Zürich. © This artwork may be protected by copyright. It is posted on the site in accordance with fair use principles. 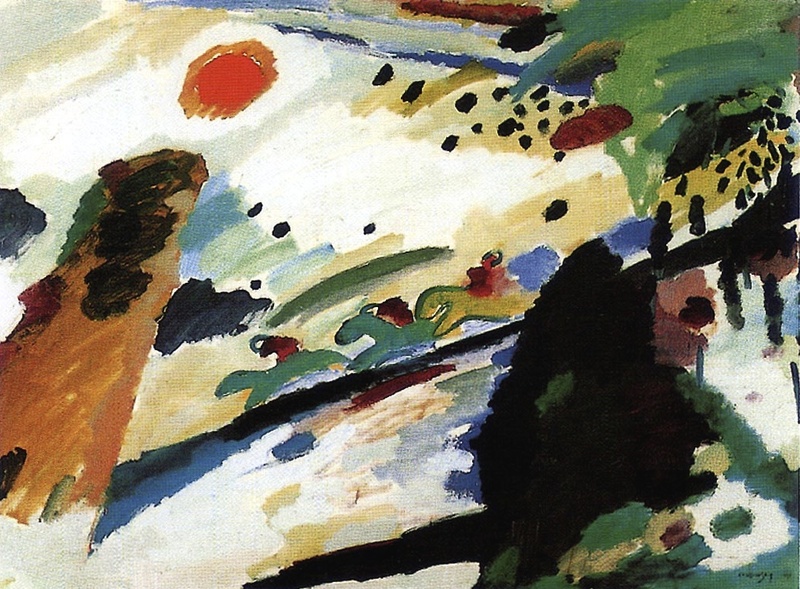 Wassily Kandinsky (Russian, 1866-1944): Romantic landscape, 1911. Oil on canvas, 94.3 x 129 cm. Städtische Galerie im Lenbachhaus, Munich, Germany. M.C. 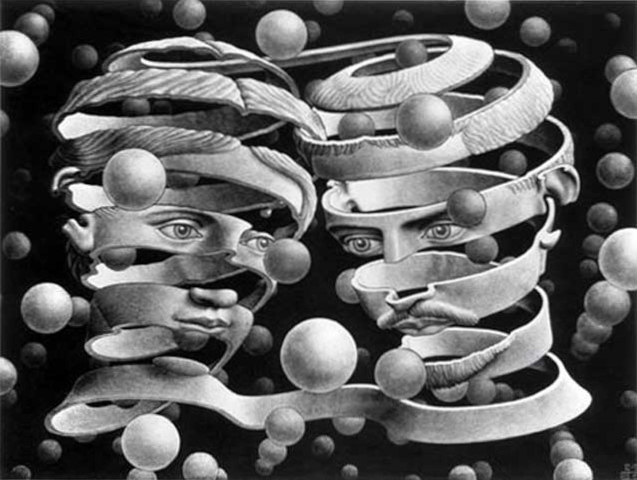 Escher (Dutch, 1898-1972): Bond of Union, 1956. Lithograph, 25.3 x 33.9 cm (10 x 13-3/8 inches). © This artwork may be protected by copyright. It is posted on the site in accordance with fair use principles. 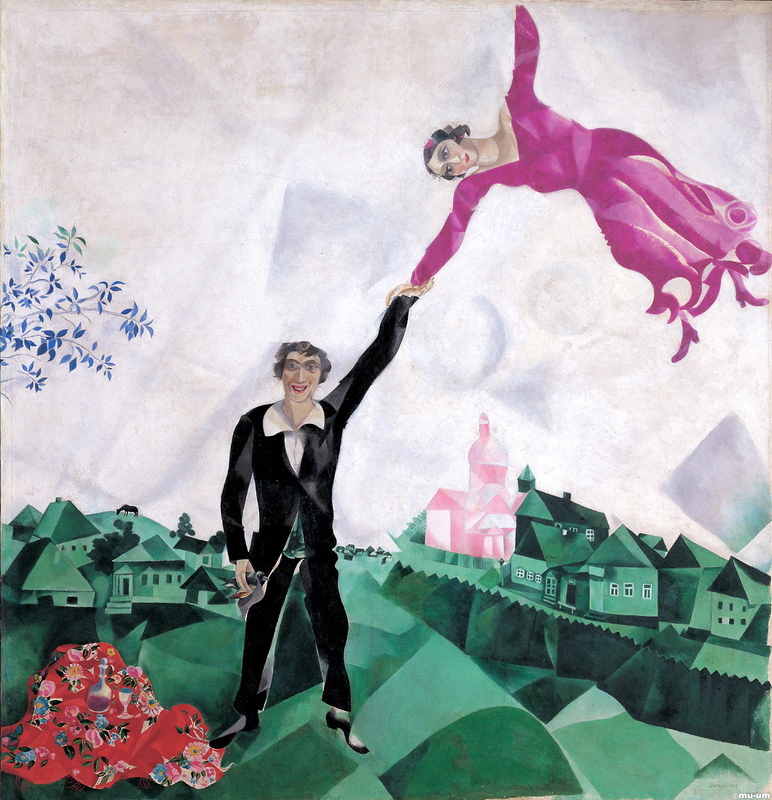 Marc Chagall [French, born Russia (present-day Belarus), 1887-1985]: Over the Town, 1918. Oil on canvas, 45 x 56 cm. The State Tretyakov Gallery, Moscow, Russia. 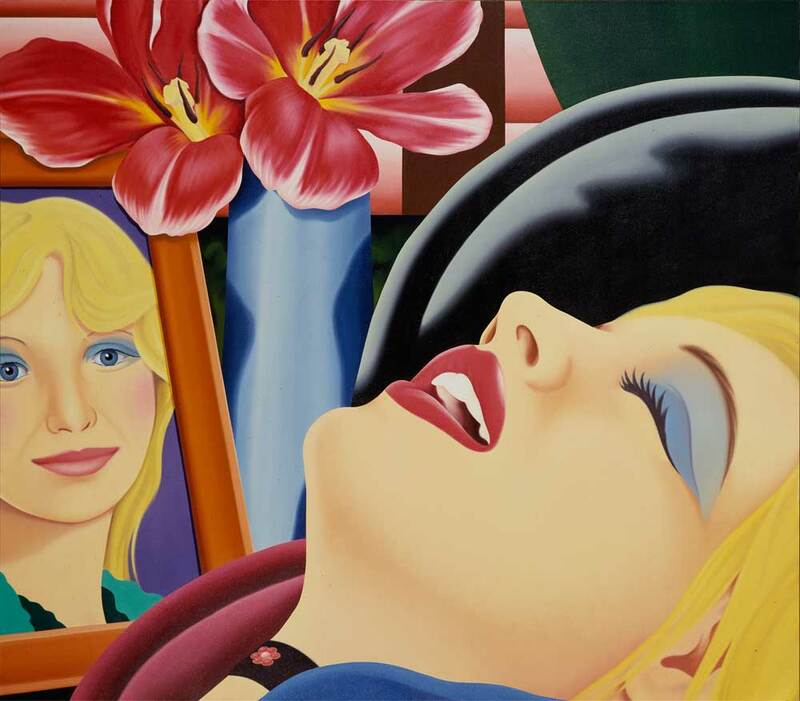 Tom Wesselmann (American, Pop Art, 1931-2004): Bedroom Painting No. 38, 1978. Oil on canvas, 213.36 x 246.38 cm, Hirshhorn Museum and Sculpture Garden Washington, D.C., USA. © Estate of Tom Wesselmann/SODRAC, Montreal/VAGA, New York (2012), Photo: Lee Stalsworth. © This artwork may be protected by copyright. It is posted on the site in accordance with fair use principles. 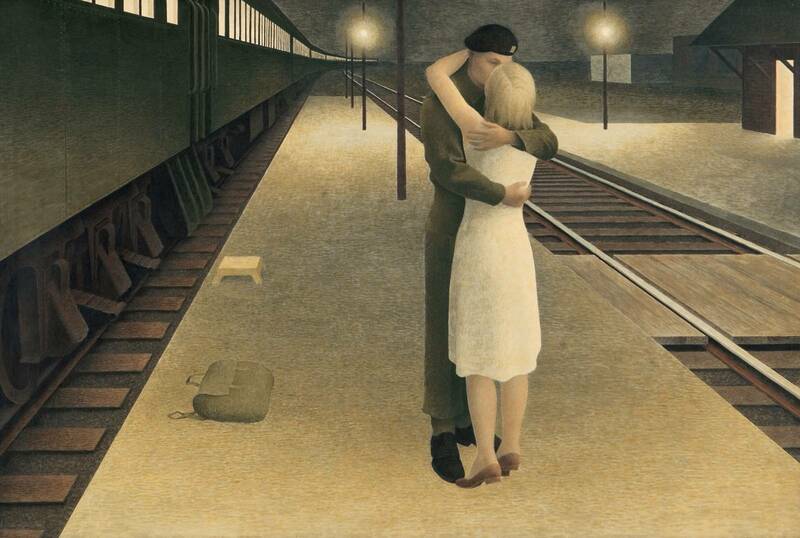 Alex Colville (Canadian; Realism, Magic Realism; 1920 – 2013): Soldier and Girl at Station, 1953. Glazed tempera on hardboard, 40.6 x 60.9 cm. The Thomson Collection, Art Gallery of Ontario, Toronto, Ontario, Canada. © This artwork may be protected by copyright. It is posted on the site in accordance with fair use principles. It has been said that reality lies not in what is revealed, but rather in what is not, or can not, be revealed. 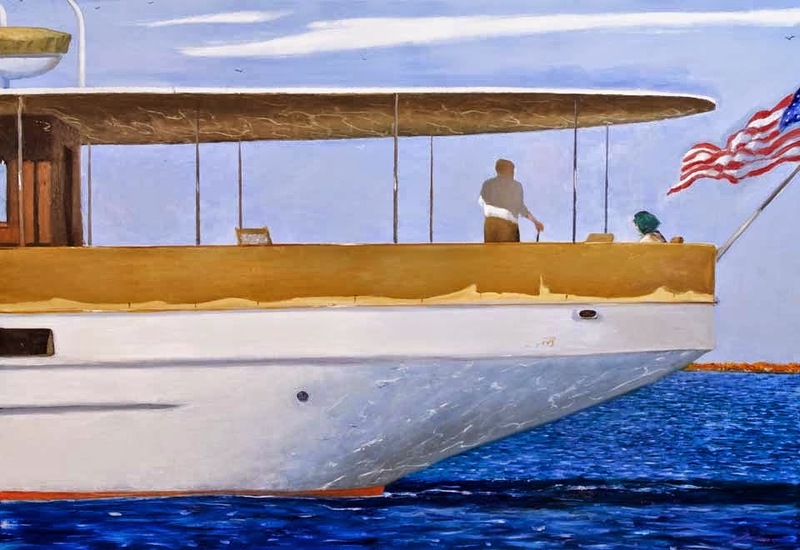 Therein lies an immense appeal of the works of Havana-born artist, Julio Larraz. 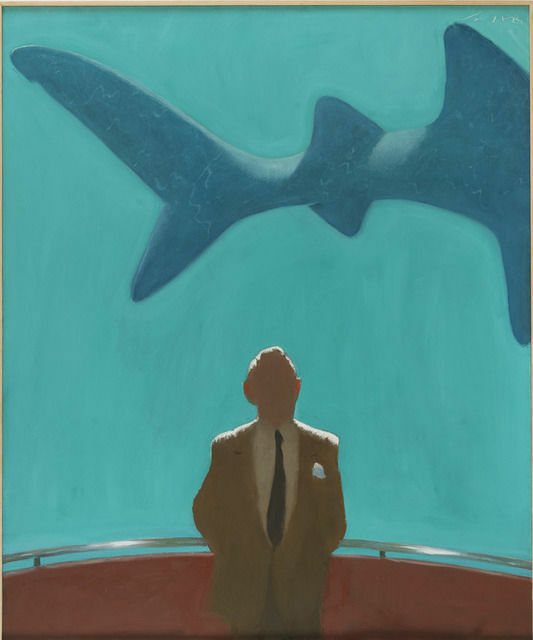 Julio Larraz (b. 1944), son of a newspaper publisher, left Cuba in 1961 with his family for Miami and remained in the US in political exile. During the 1960s, his political caricatures appeared in the New York Times, the Washington Post, the Chicago Tribune and others. Among his direct influences from 1964-1970 were Burt Silverman, David Levine, and Aaron Schikler. By 1967 Larraz worked full time as a painter. Larraz’s jewel-toned oeuvre, though infused with autobiographical and political metaphors, exudes a sense of transcending the moment, the life lived, to achieve a certain monumentality in its conception and import. His work is rooted in early modern, European art traditions, including flirtations with Surrealism, but this preeminent Latin American artist’s vision, and particularly his Caribbean visual abstractions, are uniquely his own. Often his images convey an aura of mystery, strangeness — perhaps of a concealed, lurking danger. 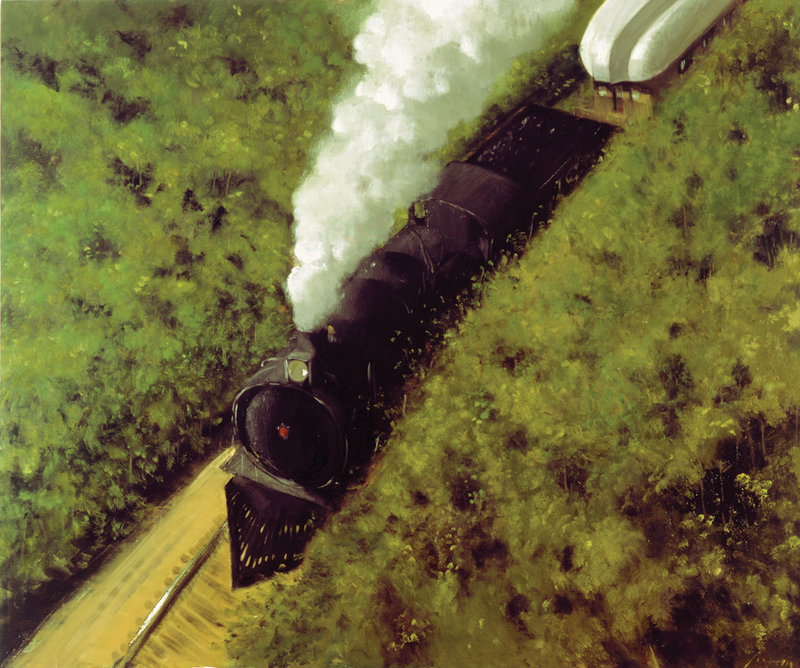 His works share an affinity with the Canadian, Alex Colville, and the American, Edward Hopper. 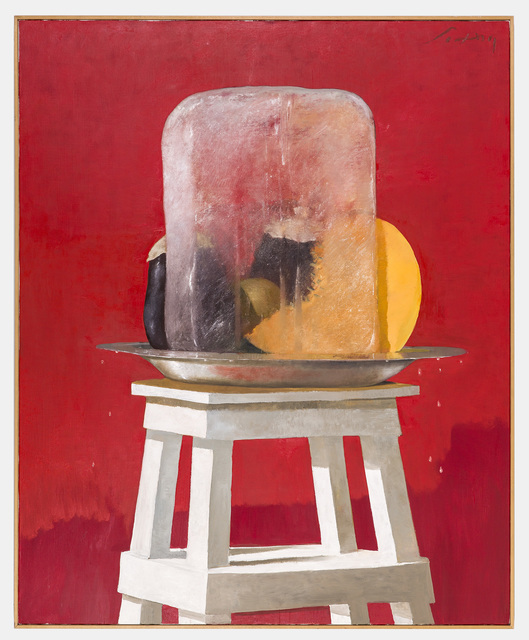 But, the multi-dimensional visual poetry of Julio Larraz challenges, stimulates and gratifies unlike any other. 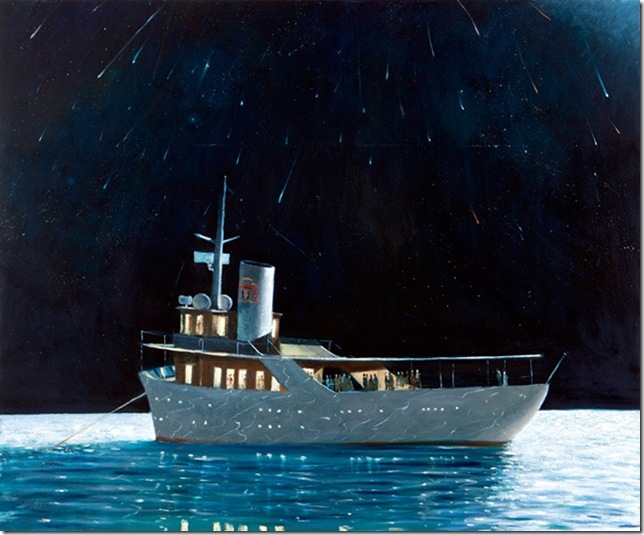 Julio Larraz (Cuban, b. 1944): Master Spy, 2011. Oil on canvas, 72 x 59-4/5 inches (183 x 152 cm). Contini Art UK, London, UK. © Julio Larraz. © This artwork may be protected by copyright. It is posted on the site in accordance with fair use principles. Julio Larraz (Cuban, b. 1944): City of New Orleans, 2011. Oil on canvas, 60 x 72 inches. All images are courtesy of the artist and Ascaso Gallery, Miami. © Julio Larraz. © This artwork may be protected by copyright. It is posted on the site in accordance with fair use principles. Julio Larraz (Cuban, b. 1944): Versos Libres, 2009. Oil on canvas, 72 x 60 inches. © Julio Larraz. © This artwork may be protected by copyright. It is posted on the site in accordance with fair use principles. Julio Larraz (Cuban, b. 1944): The Ice, 2001. Oil on canvas, 73 × 59 inches (185.4 × 149.9 cm). Private Collection. © Julio Larraz. © This artwork may be protected by copyright. It is posted on the site in accordance with fair use principles. 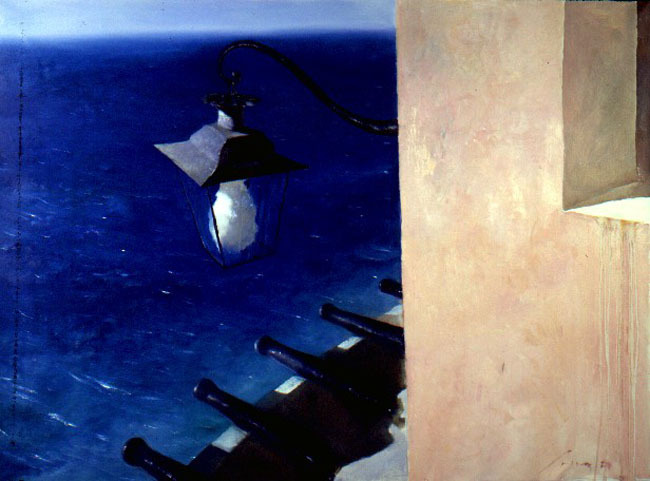 Julio Larraz (Cuban, b. 1944): On the Sea of Cortez, 2012. Oil on canvas, 72 x 78 inches (182.9 x 198.1 cm). Private Collection. © Julio Larraz. Image: © Christie’s. © This artwork may be protected by copyright. It is posted on the site in accordance with fair use principles. 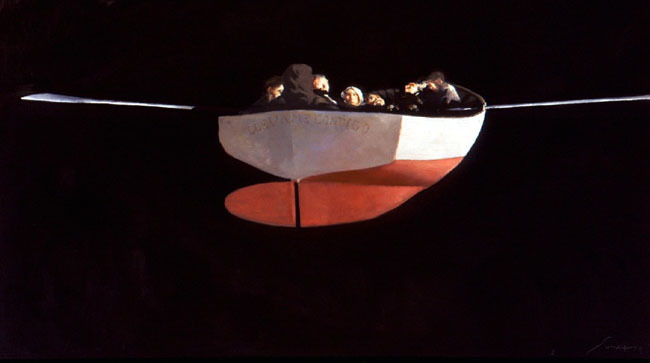 Julio Larraz (Cuban, b. 1944): Astral Flight, 1990. Oil on Canvas, 49.5 X 88.5 inches. © Julio Larraz. © This artwork may be protected by copyright. It is posted on the site in accordance with fair use principles. 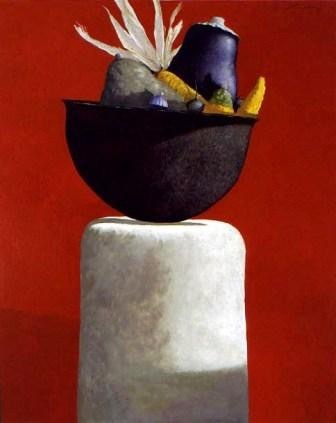 Julio Larraz (Cuban, b. 1944): Sunday on the Narragansett, 2013. Oil on Canvas, 60 x 72 inches. © Julio Larraz. © This artwork may be protected by copyright. It is posted on the site in accordance with fair use principles. 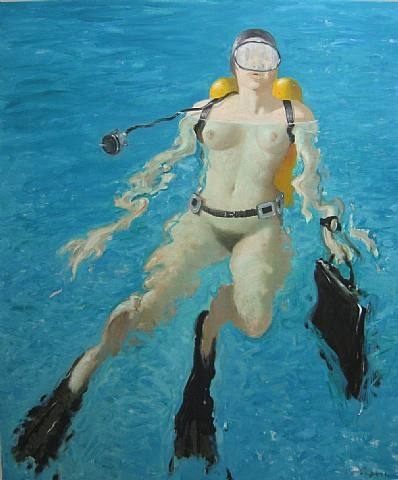 Julio Larraz (Cuban, b. 1944): Desplante, 2013. Oil on canvas, 72 x 60 inches. © Julio Larraz. © This artwork may be protected by copyright. It is posted on the site in accordance with fair use principles. Julio Larraz (Cuban, b. 1944): Cañonera, 1987. Oil on Canvas, 50-3/5 x 69-1/2 inches. © Julio Larraz. © This artwork may be protected by copyright. It is posted on the site in accordance with fair use principles. Julio Larraz (Cuban, b. 1944): Autumn, 2000. Oil on canvas. Private Collection. © Julio Larraz. © This artwork may be protected by copyright. It is posted on the site in accordance with fair use principles. Julio Larraz (Cuban, b. 1944): Lluvia de Estrellas (Rain of Stars), c. 2008. Oil on canvas. © Julio Larraz. © This artwork may be protected by copyright. It is posted on the site in accordance with fair use principles.